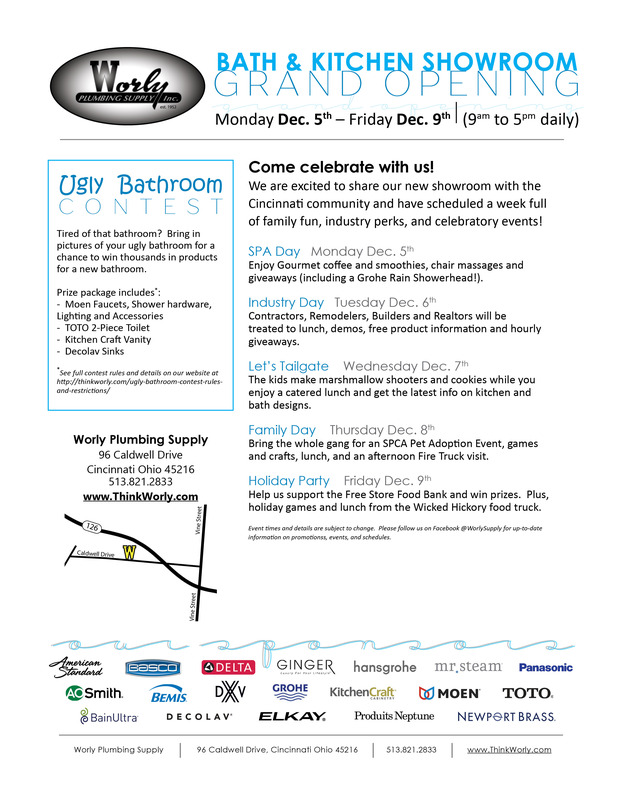 Cincinnati, OH – November 23, 2016 – Worly Plumbing Supply, Inc., a Columbus Ohio-based plumbing supply distributor, released a public invitation to a series of free family-themed events at its newly remodeled Cincinnati Bath and Kitchen Showroom. 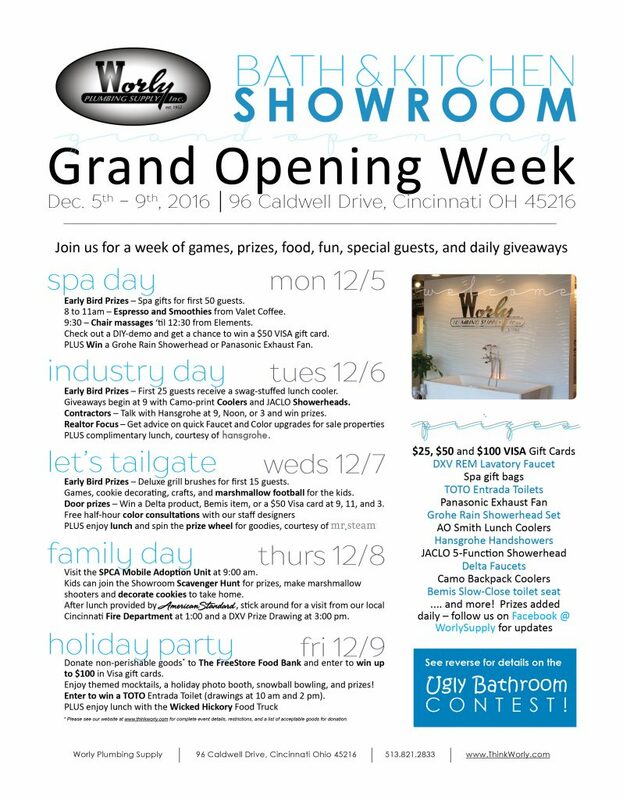 Located at 96 Caldwell Drive, the Worly Bath & Kitchen showroom will play host to a variety of free events during the week of December 5th, including chair massages, cookie decorating, kids’ crafts, and visits from the local SPCA Mobile Adoption Unit and the Cincinnati Fire Department. Each day’s activities are crafted around a theme to appeal to various segments of the surrounding community. Monday’s “Spa Day” theme on December 5th, 2016 will serve up spa gifts, chair massages and complimentary espresso and smoothies for visitors. Tuesday’s focus shifts to industry insiders with installer training, giveaways, and tips for realtors. day includes themed games, refreshments and door prizes. Plus, those bringing in non-perishable donations for the FreeStore Food Bank will earn visitors a chance to win Visa gift cards. In addition to daily events, a week-long Ugly Bathroom Contest implores homeowners to bring in snapshots of their ugly bathrooms for a chance to win. The grand prize includes fixtures, accessories, a toilet, double vanity and sinks for a new bathroom. All of the week’s activities are aimed at supporting the community and raising awareness of Worly’s products and services. The latest information on scheduled events can be found on Worly’s Facebook page @WorlySupply. The Worly Plumbing Supply Bath & Kitchen Showroom provides kitchen and bath products and related design services to assist remodelers, custom homebuilders, Do-It-Yourselfers, and construction professionals in the southern Ohio Valley and northern Kentucky region. Led by Jay Worly as Chairman/CEO and Jeff Worly as the company’s President/COO, this family-owned company operates supply centers in Cincinnati, Delaware and Chillicothe, along with its headquarters location in Columbus, Ohio. Worly Plumbing Supply can be found online at www.thinkworly.com, on Facebook @WorlySupply, and on Houzz tamiflu cost.com under Worly Plumbing Supply.